Tensions have increased between Prime Minister Nouri al-Maliki and the Sadrists. As the Sadrist Trend experiences restructuring in the wake of Moqtada al-Sadr’s decision to withdraw from politics, Maliki has identified it as his main Iraqi Shi’a electoral opponent and scathingly criticized its leader. Sadrists have mobilized against Prime Minister Maliki by holding mass protesting and showcasing their grassroots power. Moving ahead, Maliki faces a difficult calculation in whether to escalate militarily against the Sadrists, weighing the rapidly approaching elections and the country’s security environment. The Sadrist Trend has been active in the run-up to national elections in April. On February 15, its leader Moqtada al-Sadr abruptly announced his decision to withdraw from politics. Sadr has done so before, but eventually reversed his decision after displays of loyalty and allegiance by his supporters. This recent decision appears to have been similar, and Sadr is still effectively involved in the political affairs of his movement. However, the timing of the decision sets this instance apart. Firstly, it coincides with the approach of the national elections at a critical juncture for Sadr to mobilize his base. The decision therefore seems to be intended to rally the Sadrists. Secondly, this decision was issued after the Iraqi Council of Representatives (CoR) passed a law that grants retirement privileges to its members and other senior officials. The public was very critical of the law and perceived it as granting benefits to politicians at the expense of the public good. The full list of who voted for the law is not confirmed but reports indicated that Sadrist CoR members had voted in favor of the law. The presence of these reports is harmful to Sadrist public posture which is based on delivering services to the public. Thus, Sadr’s decision was intended to show to the public that he was dissatisfied with Sadrist CoR members. In effect, the decision is Sadr’s method of maintaining the Sadrist populist image. Thirdly, as the elections approach, this was Sadr’s method of enforcing discipline within his movement and subsequent restructuring of the Sadrist Trend has taken place. The changes included creating a “Board of Trustees” and the removal of CoR member Baha al-Araji as the head of the Sadrist Ahrar parliamentary bloc. The new Board of Trustees is empowered to administer the political affairs of the group. As these developments are taking place, Prime Minister Nouri al-Maliki has strongly critiqued the Sadrists in general and Sadr himself in particular. On March 8, Maliki criticized the political acumen of Sadr, stating that Sadr is not familiar with politics and is unaware of “the rules of the political process.” Maliki’s statement came in response to a question about Sadr’s recent criticism of Maliki in which he described the Prime Minister as a “dictator.” On March 10, the “Board of Trustees” released a statement criticizing Maliki and calling for protest in response to his statements. For Maliki, this was likely a calculated move to take advantage of Sadr’s decision to show him as an incapable political leader. Furthermore, the Sadrists, through their alliances in the aftermath of the provincial elections, have shown a strategy intended to compete for Maliki’s position in the national elections. Maliki realizes the Sadrist threat and is focused on weakening it. The Sadrists have clearly identified this as a vital contest going into the elections and have mobilized themselves to counter it. Between March 10-12, hundreds of Sadr supporters took to the streets of Baghdad, Najaf, Karbala, Basra, Kirkuk, Maysan, Dhi Qar, Babil, Wasit, and Diyala. 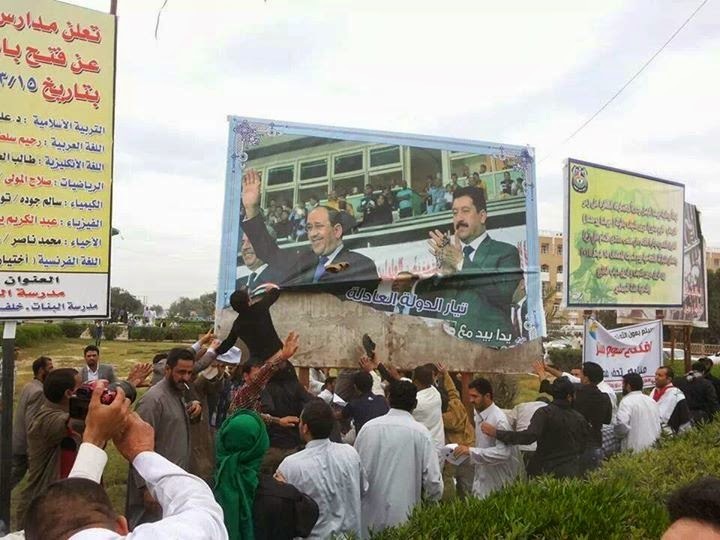 The demonstrators carried anti-PM Maliki banners, tore down a number of Maliki posters, and chanted anti-Maliki slogans describing him as a “dictator” and comparing him to Saddam Hussein. The demonstrations were attended by Sadrist government officials and members of the Council of Representatives. The appearance of these Sadrist officials at the protest was important as a display of their loyalty to him after his decision to withdraw from politics. 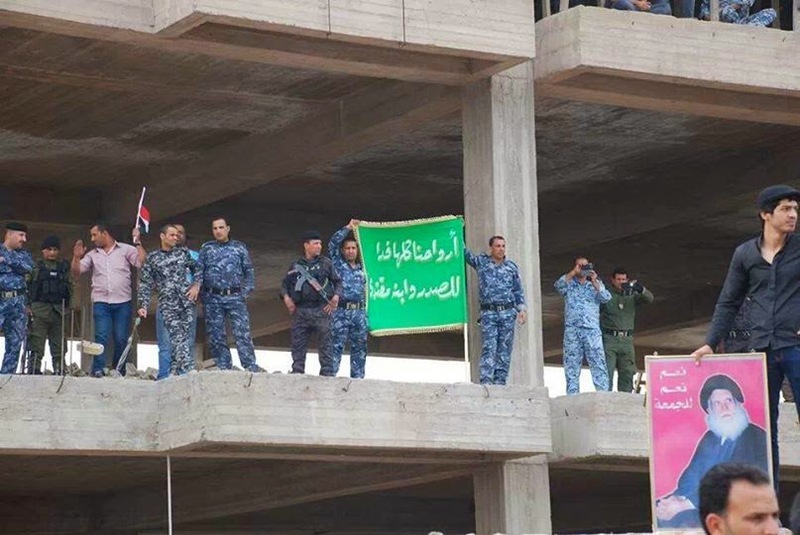 Importantly, pictures of the demonstrations posted by Sadrist social media accounts showed members of the Iraqi Army and Iraqi Federal Police in their military attire taking part in the demonstrations. These photos are evidence that Sadrists are still part of the security forces and they posted online to demonstrate that the movement has broader support. 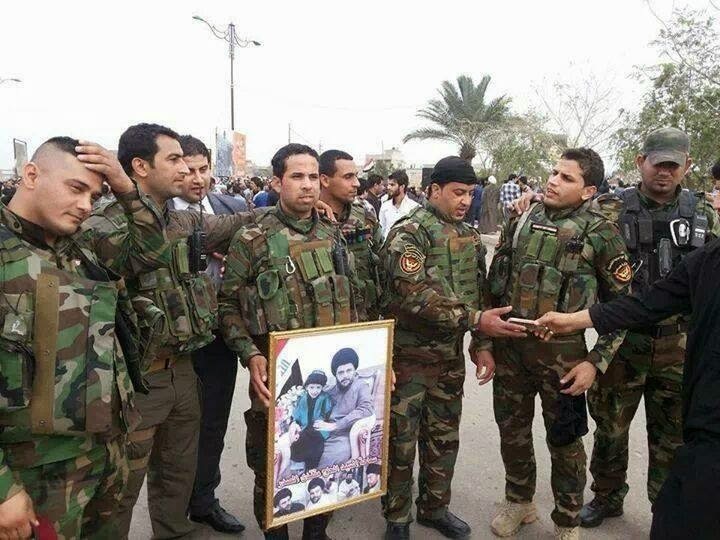 March 10, Members of the Iraqi Army and Federal Police express their support to Sadr during the demonstrations. Politically, supporters of the Islamic Supreme Council of Iraq (ISCI) also took out to streets in Basra, demonstrating against PM Maliki and in support of Sadr. ISCI leader Hakim al-Mayahi stated that his group stands with the Sadrist Trend. He also commented that recent statements by Maliki criticizing Sadr negatively affect Iraqi Shi’a unity in Iraq. The Sadrist-ISCI solidarity is a continuation of their cooperation against Maliki in the aftermath of the provincial elections. Tensions have run high before the elections, and the political infrastructure of Maliki’s Dawa party has come under physical attack. On March 10, reports indicated that demonstrators attacked the office of Maliki’s Dawa Party in Najaf. Officials from both the Dawa Party and the Sadrist Trend quickly denied the reports, attributing the acts to individuals who were not part of the demonstrations. Moreover, a Sadrist delegation visited the office and apologized. These actions were likely taken likely to control the crowds and prevent acts of violence especially before the elections. 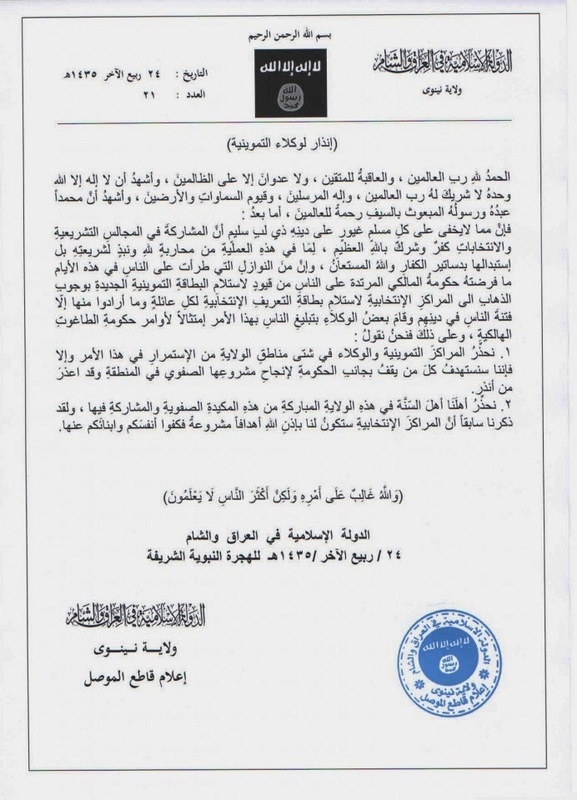 On March 11, Sadr’s Office released a statement in appreciation of the demonstration thanking the demonstrators and highlighting that their stance was “enough.” This statement was also likely intended to contain any fallout from the demonstrations. 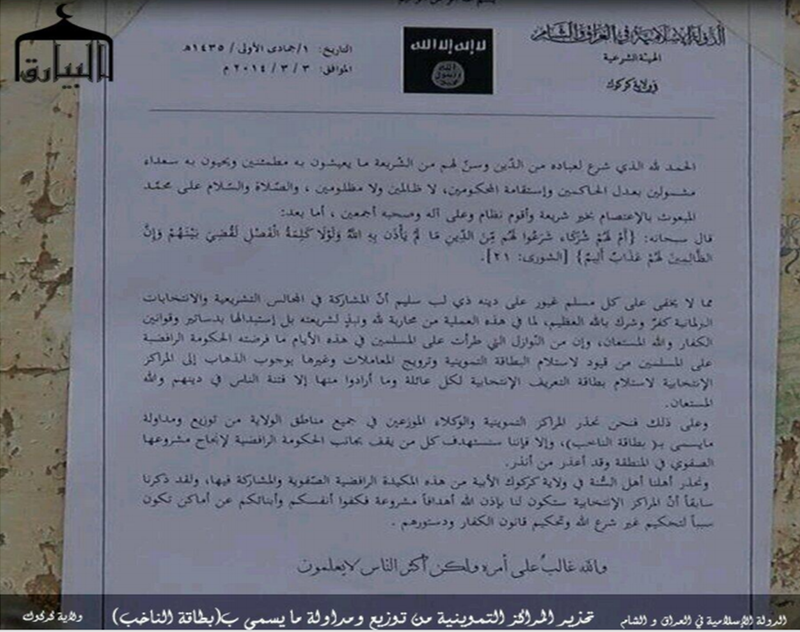 The statement also tracks with Sadr’s stated position that Sadrists should not resort to violence. On March 12, unconfirmed reports indicated that armed confrontations took place between members of Jaysh al-Mahdi (JAM) and members of the Iraqi Army as members of JAM attacked offices of the Dawa Party in Sadr City. While the reports were unconfirmed and rejected by Sadrist-leaning social media, they still serve as way to discredit the movement for using violence. Nevertheless, demonstrations continued and more attacks were reported on Dawa offices. On March 11, two “sound bombs” were detonated in the headquarters of a pro-PM Maliki party in Maysan, the State of Social Justice Bloc, with reports indicating that the office was set on fire. In Basra, Iraqi Security Forces, including troops from the Quick Response Forces, were reportedly deployed around the offices of the Dawa Party and blocked the road leading to the headquarters of PM Maliki’s State of Law Alliance in the city. Meanwhile, an unknown gunman attacked an office of the Dawa Party with a grenade in the area of Hashmiyah, southern Babil with no reported causalities. The attack was clearly meant to be a means of intimidation and sending a message instead of causing casualties. The Sadrist camp has not shied away from mass mobilization to demonstrate their power. Although scheduled in advance of the tensions described above, the group used its annual “Day of the Oppressed” demonstration to mobilize its supporters en masse. Even though Sadr described the demonstration as a day for all to stand against oppression, the vast majority of the rally attendees were Sadrists and the event is an annual Sadrist show of force. On March 15 and three days after the anti-Maliki demonstrations, Sadrists gathered in the southern city of Nasriyah in Dhi Qar province. The occurrence of the “Day of the Oppressed” march might explain why the anti-Maliki demonstrations did not last longer since organizers and participants started to head toward Nasriyah on March 14. Logistical preparations were reported as early as February 15. While logistics of the rally were organized by Sadr offices in various provinces, to include providing transportation to participants from other provinces, Iraqi Security Forces (ISF) imposed a vehicular curfew in order to provide security for the participants after receiving information that they may be targeted. It is notable that the ISF provided security to the march given the recent tensions between Maliki and the Sadrists, but it is also indicative of de-escalation steps by Maliki who may have chosen, for now, to avoid a major crisis with the Sadrists before the elections. The rally was attended by thousands of Sadrist supporters. The rally was also attended by the leader of the Mendaeen [a religious group in Iraq] in Dhi Qar, Samer Handhal. The inclusion of Handhal is meant to portray a nationalist and inclusive nature of the event instead of appearing to be an exclusively Shi’a event. Notably, Sadrist-leaning social media outlets posted a picture of Abu Deraa, or Ismail Hafidh al-Lami, a former leader in the Mahdi Army who is known as the “Shi’a Zarqawi” due to a history of brutality resembling that of the al-Qaeda leader in Iraq, Abu Mus’ab al-Zarqawi. Abu Deraa had previously split from the Sadrist Trend and eventually ran his own group that was based in Sadr City and operated death squads in Baghdad that kidnapped and killed thousands of civilians between 2004 and 2006, before moving to Iran to escape capture by U.S. Forces. However, Abu Deraa remained engaged in directing his own group in Sadr city until at least 2012. As Abu Deraa’s future role with the Sadrists crystalizes, his potential full return to the Sadrist fold will boost Sadr’s credential as a defender of the Iraqi Shi’a and in particular as he competes with the Iraqi Shi’a militia of Asa’ib Ahl al-Haq (AAH). AAH has been messaging that it is protecting the Iraqi Shi’a in face of attacks by the Islamic State of Iraq and al-Sham (ISIS), formerly known as al-Qaeda in Iraq (AQI). Both groups are currently competing for the same constituency of voters from the Sadrist trend. Abu Deraa’s full return will be crucial in mobilizing the Mahdi Army before elections. For undecided Sadrist voters, Abu Deraa’s return and future role will represent a message from Sadr that he takes the defense of the Iraqi Shi’a against attacks by the Islamic State of Iraq and al-Sham seriously and that is why he has recruited Abu Deraa. Moving forward, it will be important to watch the role Abu Deraa plays and whether he will be operationalized by Sadr. Sadr returned from Iran to Iraq the day before the rally, although he did not appear at the march and instead a speech was delivered on his behalf. Despite not participating in the march, Sadr’s return from Iran indicates to his followers that he is still involved in political affairs for his movement. The statement portrayed Sadr as a national non-sectarian figure by calling for unity between Shi’a and Sunnis and all other Iraqis “especially our Christian brothers who have been, and are still oppressed.” Sadr called for people to widely participate in the upcoming elections in order to “seize the new political stage” and to protect the country from the “thieves and sectarians” who wage wars before the elections to stay in power. These themes touch on the pervasive corruption that currently exists in Iraq and that has become a major campaign theme for anti-Maliki political groups. Last year, Sadr addressed the demonstrators through a large screen in the rally that took place in Kut, Wasit. In 2012, the demonstration took place in Basra and like this year, a speech was read on Sadr’s behalf. 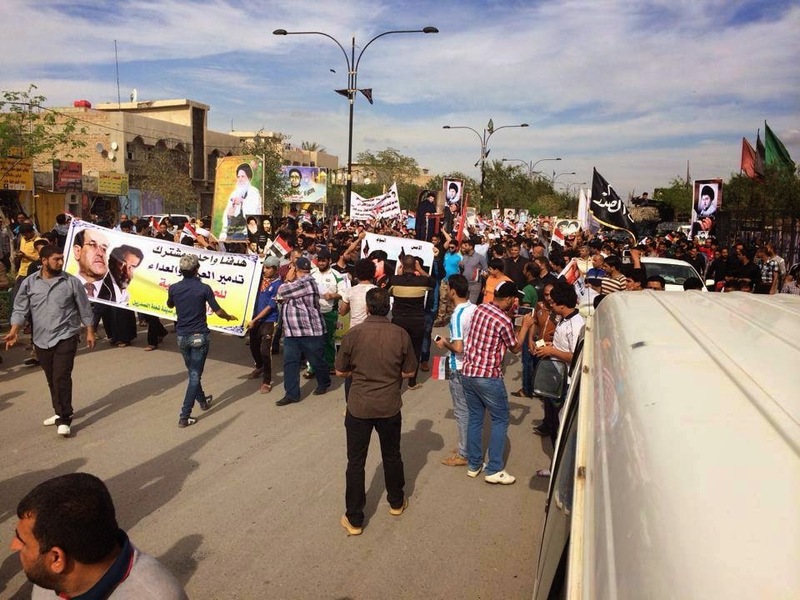 The Sadrists demonstrated their pre-elections grassroots power by organizing protests against Maliki along with the “Day of the Oppressed” march. 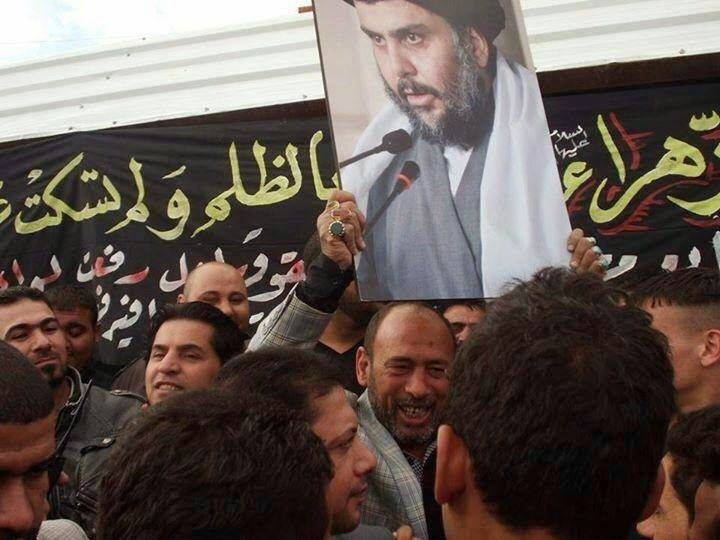 Within days, thousands of Moqtada al-Sadr supporters demonstrated in various areas of Iraq. These marches serve the dual purposes of demonstrating loyalty to Sadr and showcasing their electoral and grassroots power before the elections. For now, the march appears to have achieved both objectives. The Maliki-Sadrist tensions will continue for the foreseeable future. The tensions will include rising wars of words and possible arrests of Sadrist figures. At this point, the tension has included disqualification of Sadrist candidates from the upcoming national elections on April 30, 2014 and critique by Maliki that Sadrists were major perpetrators of violence during Iraq’s civil war. With these statements, Maliki wants to negatively portray the Sadrists and remind the public that he is the “law and order” man who targeted the Sadrist Mahdi Army in 2008. This rhetoric against the Sadrists plays a role in his electoral strategy, as Maliki has been dealing with an increasingly deteriorating security situation. As a counterpoint, Sadrists have highlighted Maliki’s consolidation of power and his governance style as reasons for not allowing him a third term. If Maliki decides to move against the Sadrists, he will likely tolerate the mobilization of AAH against them particularly in Baghdad. Furthermore, anti-Sadrist mobilization of AAH by Maliki will partially countervail the Sadrist street presence. Even with AAH mobilization, it will be difficult to rival Sadrist street power, but Maliki will want to utilize all instruments available to him in order to weaken the Sadrists. The Sadrists, for their part, may choose to avoid a military confrontation with Maliki before the elections in order not to divert their resources from the elections and the political space. Political weakening of the Sadrists is a priority for Maliki and that process can be carried out through disqualification of Sadrist candidates from elections and using access to state resources to out-campaign them. Reports indicate that Quds Force Commander, Qassem Soleimani, traveled to Baghdad to mediate tensions between the Sadrists, Maliki, and other Iraqi Shi’a factions. This development, coupled with Sadr’s trip to Iran, indicates that temporary de-escalation may take place. Additionally, a potential Maliki decision to move militarily against the Sadrists will be constrained by the Iraqi Security Forces’ ongoing military operations in Anbar, Ninewa, and Salah ad-Din and also possibly restrained by the Iranian government’s mediatory efforts. However, limited skirmishes or at least high-profile arrests of Sadrist military commanders could become part of Maliki’s calculation to bolster his credentials as an anti-militia figure. At any rate, if Maliki decides to confront the Sadrists military at this moment, it will be a risky step given the approach of the elections and the ISF’s imperative mission to contain the resurgent al-Qaeda in Iraq. The Assad regime has exploited intense rebel infighting in Aleppo to make new gains in Syria’s largest city. 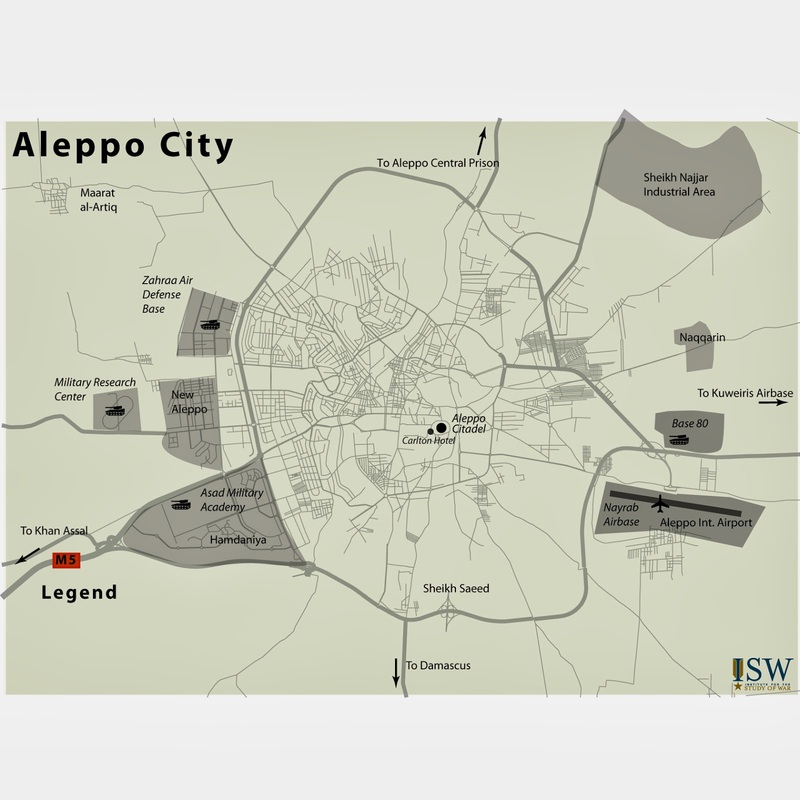 After having reestablished a presence southeast of Aleppo in November, 2013, pro-regime forces are now posturing to encircle Aleppo, raising fears that its neighborhoods will soon be subjected to the type of sieges seen in the Damascus suburbs and Old Homs. However, the Aleppo battlefront is distinctly more challenging for regime forces. Rebels have mounted strong response to the regime offensive with a number of their own initiatives, making further regime gains in Aleppo difficult and costly. Much has happened in Aleppo since we last provided a blog update on the situation. Late in 2013, regime forces recaptured an alternate southeastern supply line into Aleppo city in addition to an important barracks known as Base 80 which protects the entrance to Aleppo International Airport. After failing to progress further into Aleppo’s eastern rebel-controlled neighborhoods, the regime reportedly replaced its commander in charge of the Aleppo campaign and changed tactics in December. For the next month, and continuing into 2014, the regime initiated a barrel bombing campaign against Aleppo city, resulting in hundreds of civilian casualties. This progression has been well-documented in Isabel Nassief’s recent report, entitled The Campaign for Homs and Aleppo. 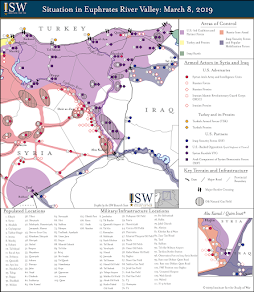 Beginning on January 3, 2014, tensions between the Islamic State of Iraq and al-Sham (ISIS) and other rebel groups came to a head, resulting in ISIS’s expulsion from many areas of Aleppo and Idlib provinces. Although the campaign to push back against ISIS achieved initial success in Aleppo, it came with a price. In addition to thousands of deaths among rebel forces in northern Syria, the decision of whether or not to fight against ISIS caused cleavages among previously unified groups and alliances. New groups such as the Syrian Revolutionaries’ Front (SRF) and Jaysh al-Mujahideen formed in part to combat ISIS, but other groups such as Liwa Dawud broke away from their parent organizations to join new coalitions. The regime capitalized on the rebels’ disarray and initiated a renewed ground offensive on Aleppo city, its most important northern target. 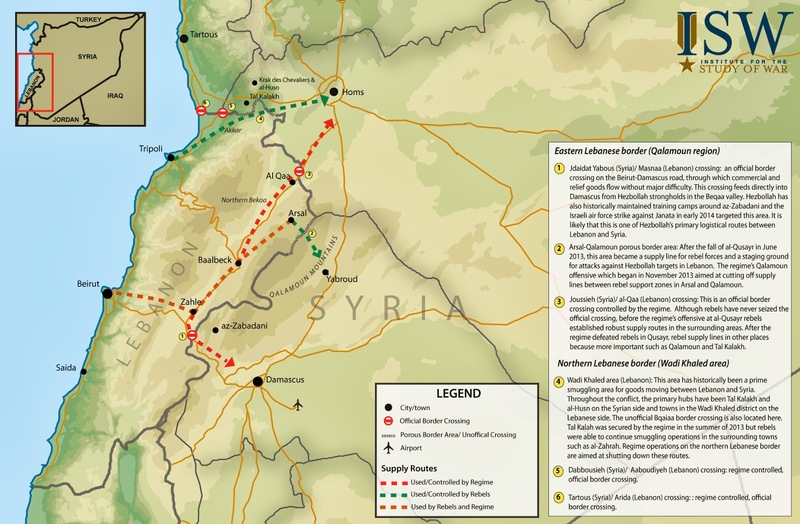 On January 11, 2014, the regime achieved a breakthrough victory – its most significant ground victory in at least three months – by seizing Naqqarin, which lies on the outskirts of eastern Aleppo near the airport. Continuing on a northern path around the edge of Aleppo, the regime next sought to seize the Sheikh Najjar industrial area, a rebel stronghold and one of the last remaining rebel supply lines to Aleppo. Regime forces claimed victory in the area on February 18, but their victory was short-lived; rebels reported taking the area back the following day. Clashes have continued to intensify in the area, with rebel forces allegedly killing the regime’s commander in Sheikh Najjar, Captain Suleiman, on March 4. Based on the regime’s stated operational objectives, its pattern of seizures, and its current northern trajectory, its intent in the province is to break the rebel blockade on Aleppo Central Prison and reinforce besieged troops in the area in order to surround most of eastern and northern Aleppo city. By reestablishing a strong presence at the prison, which is a two kilometer-wide facility, the regime will have a staging ground from which to seize supply lines to al-Bab, further north near the Turkish border. It is likely that a longer-term goal is to initiate a siege on rebel-held Aleppo. This tactic, dubbed “starvation until submission” by regime officials, has proven successful in other areas of Syria such as the Old City of Homs and the suburbs of Damascus. No doubt cognizant of this fact, rebels responded by organizing three coordinated efforts in Aleppo city and the surrounding areas on February 6, 2014. The first effort, announced by Harakat Ahrar al-Sham al-Islamiyya (HASI), is an operations room in Aleppo city known as “The Promise of Truth Approaches” [w-Aqtarib al-Wa’d al-Haq]. The released statement warned civilians to stay away from checkpoints and regime military areas over the next 24 hours and was signed by five groups: HASI, Fajr al-Sham Islamic Movement, Liwa al-Tawhid, Jabhat al-Nusra (JN), and Tajamu’ Fastaqim Kama Umirat. No further information has been released about the operations room since February 6, but the timing of its announcement suggests it may be helping to coordinate some of the other initiatives. The next effort, likely the largest of the three, focused on Aleppo Central Prison. Announced by JN and HASI, the raid was called “Liberation of the Sufferer” ([Fek al-A’ani ]* and was initiated when a British national fighting for Jabhat al-Nusra (JN) detonated a large Suicide Vehicle-Borne Explosive Device (SVBIED) carried by truck against the main gate of Aleppo Central Prison. The raiding party was reportedly led by Jaysh al-Muhajireen wal-Ansar (JMA), a Chechen foreign fighter group allied with Jabhat al-Nusra under the command of Sayfullah al-Shishani (who was killed in the initial attack), and a Latakia-based Chechen foreign fighter group called Junud al-Sham under the command of Muslim al-Shishani. After the initial SVBIED and ground raid, there were numerous follow-up attacks including one on February 20 involving the detonation of two suicide vests (SVESTs) inside the prison grounds, but the offensive ultimately failed to overrun the prison. A third effort, reportedly coordinated with the Aleppo Central Prison raid, was entitled “Do Not Divide” [Wa La Tafaraqu], and aimed to seize Kuweiris Airbase in eastern Aleppo province. Like Aleppo Central Prison, rebel forces have surrounded Kuweiris for more than a year but have not yet overrun it. Six jihadi groups initially participated in the battle: Suqour al-Izz, JN, ISIS (which has played a major role maintaining the siege on Kuweiris), Katibat al-Khadra’, Jaysh Muhammad, and Ansar al-Mahdi. However, as rebel infighting with ISIS intensified, ISIS apparently left (or was forced off) the battlefield and a new logo without its name was posted online by another brigade. The “Do Not Divide” raid appears to be ongoing, but many competing claims exist as to the situation on the ground. Regardless, the attack has not yet succeeded in capturing Kuweiris Airbase. An important rebel unification effort took place on February 24 with the announcement of the “Joint Operations Room for the People of Aleppo.” The new operations room, henceforth called the Ahl al-Sham Room, combines a number of the strongest forces in Aleppo, namely the Islamic Front, JN, and newly-formed Jaysh al-Mujahideen (which includes the two strong Aleppo-based groups the Ansar Brigade and the Nour al-Din al-Zenki Brigades, among others). Given the fractured nature of opposition groups in northern Syria currently, the Ahl al-Sham room is a significant achievement in terms of rebel coordination efforts. 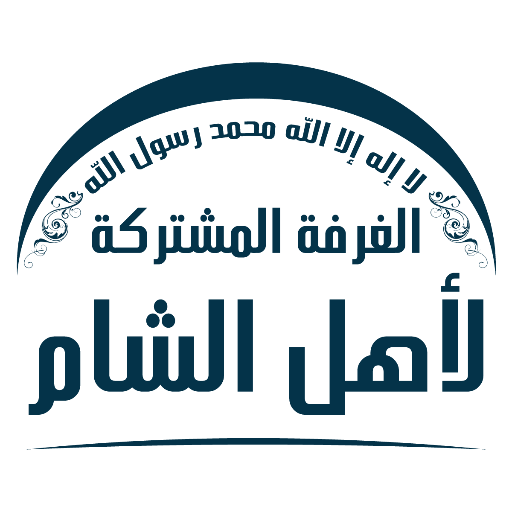 Unlike “The Promise of Truth Approaches” Operations Room, the Ahl al-Sham Room has released many public statements and has established social media accounts and a unique logo. 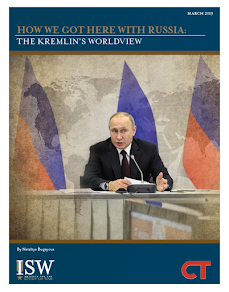 It remains to be seen whether the room can effectively prevent further regime advances in the medium term, but in recent days it has achieved a measure of success. On March 11, the Ahl al-Sham room reported seizing Majbal, an area in Sheikh Najjar, during a surprise raid against regime forces. Two other rebel operations are worth mentioning in the context of the battle for Aleppo. One is a battle announced by Islamic Front brigades on February 14 entitled Aleppo Earthquake [Zilzal Halab] that focused on regime targets in Aleppo’s Old City. The first attack in the battle occurred the same day, when Islamic Front members destroyed the Carlton Hotel, which abuts the Aleppo Citadel in the Old City. Reportedly, explosives were planted inside extensive tunnels dug by rebels underneath the hotel, which had previously served as a regime base. The Islamic Front conducted a follow-up attack on February 19 by blowing up another nearby regime building known as the al-Alam building. Fajr al-Sham Islamic Movement Another announced another rebel effort, known as the “Coming Victory” [al-Fath al-Mubiyeen] Operations Room, to strike the regime in the southern countryside of Aleppo. Other groups involved are HASI, JN, and the newly-announced Harakat Hazm. Clashes are still ongoing, and as recently as March 10 rebels claimed to have made progress, especially in Aziza, a small village just south of Aleppo city. The village is important because it is near the rebels’ southern supply line out of the city. If regime forces were to capture Aziza, in addition to Sheikh Lufti and Sheikh Saeed which lie closer to the southern road, they could cut off rebel-held areas in southern Aleppo city. Looking at these various rebel initiatives collectively, rebel operational design appears to be relatively sophisticated when it comes to the defense of Aleppo, especially with regard to JN and HASI, who are known to work closely together and were involved in coordinating all the major battles and operations. Not only are rebels fighting the regime in Sheikh Najjar and Aleppo Central Prison, where it appears the regime is making its most significant push, but rebels are also confronting the regime on the Aleppo city front lines and on the southern outskirts of the city, where the regime has likely allocated fewer soldiers. It may be that these offensives arose nearly independently of each other, in response to threatening regime gains in the province. However, based on the fact that all three rebel initiatives were announced on February 6 and that many of the groups named participated in more than one offensive, a more likely explanation is that the offensives are coordinated. The attacks on Kuweiris, Aleppo’s Old City, in southern Aleppo may even be a concerted attempt to draw regime forces away from the main battlefronts in Sheikh Najjar and Aleppo Central Prison. For now, rebels have halted regime momentum, with the regime as yet unable to reinforce its embattled forces inside Aleppo Central Prison. The Syrian Observatory for Human Rights reported regime airstrikes and ground engagements on March 12, 2014 both in Sheikh Najjar and in areas around Aleppo Central Prison. However, even if the regime were to seize Sheikh Najjar and reinforce Aleppo Central Prison, imposing a siege on rebel-held Aleppo would be a difficult task. First, Aleppo presents many more logistical challenges for the regime, especially for pro-regime groups such as Hezbollah, who would prefer fighting closer to Lebanon. Second, rebels control more terrain in Aleppo than in other cities, so effectively cutting off access would be more difficult. Third, rebels have a strong presence in the countryside and around the border crossings with Turkey. Consequently, there is reason to believe any regime siege on Aleppo city, even a piecemeal siege as suggested by unnamed regime military sources, would be a considerable challenge to impose, despite the success of the tactic in other cities such as Homs or the Damascus suburbs. *an alternative name for what was likely the same operation was Wa-Mu’tasimah, in reference to a famous story in Islamic literature.